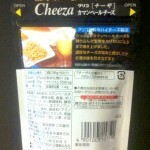 Review: Cheeza 51% Camembert | Oyatsu Break! I think it’s pretty telling that I have finished the entire bag of Glico’s Cheeza 51% Camambert Flavoured crackers before beginning the review. I’d be embarrassed, but these are just so absolutely amazing, either on their own or as bar snacks—Otsumami—that finishing off the small 38g bag is a given. It’s important to point out that Cheeza 51% Camembert has a picture on the back featuring a plate of the delicious crackers next to a glass of beer, and so the several beers I have consumed before these snacks, as well as the beer I consumed with them, are more of a ‘serving suggestion’ than any sort of impairment to writing this review… got it? Got it. Seriously though—these are the number one snack food that I wish was available in North America, bar none, and I regret informing you of how delicious these are knowing that you likely won’t be able to find them yourself. I’m sorry. Also, there are three flavours of which camembert is only one, and they’re all awesome. Packaging: When in a Japanese convenience store, you are greeted with a huge and exciting variety of products which you have never encountered before, and many of which you might never encounter again. New products are introduced and then disappear with alarming frequency, and unless you’re getting on board with the most popular, longest-lasting snack food, don’t expect your favourite to be there in another store, on your next visit during the same trip, or espescially the next year you go back to Japan. So what makes one snack stand out from the crowd? Well the big red-and-white NEW doesn’t hurt, nor does the name of the snack written in a great big font in Romaji (English letters). In Japan cheese and cheese flavouring is not traditionally terribly popular as compared to other flavours, and when you do get cheese flavouring it’s been my experience that it is considerably dialed back—and awful. 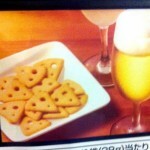 Never have Cheetos, in Japan, for example. Or do, but don’t expect “Cheetos”. A visit to Natural Lawson one rainy evening in 2010 produced our first experience with the Cheeza brand of snacks, and they popped right off the shelves. We were ready for cheese, after 2 weeks more-or-less deprived of our favourite food, and CHEEZA made big promises. Crackers shaped like wedges of cheese, pictures of real cheese on the outside, and that 51%, promising that a certain percentage of the cracker would be made of real cheese. We gave it a go, amongst the hundreds of other offerings. I think that says a lot. Also? Resealable package. Just a lovely touch of class. These smell like fresh cheese, even in the slight stinkiness of them. It’s awesome. It is strong too. Taste: Like manna from heaven, frankly. They’re buttery, that’s the first thing you notice. They’re really rich on your tongue. The cheese flavour is strong too—while camembert isn’t the strongest-tasting cheese, this has all of that flavour and then some as the cheese has been baked into a salty cracker (best accompanied by beer). 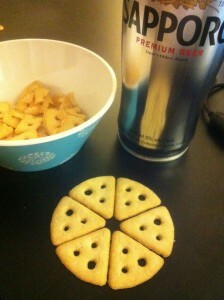 The saltiness and the cheese flavour aren’t overbearing either, these don’t make you reach for your beer to wash them down, they make you reach for another cracker. Verdict: I’ll level with you—I’m a huge fan of cheese crackers. Ritz did the trick when I was a kid, but when I discovered Nabsico’s Cheese Nips (seriously, real name, I realize it’s kind of out-of-context-racist) I left Ritz behind. 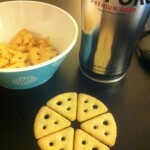 They’re awesome crackers. 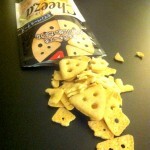 Then I discovered Cheese Its and… it’s just a whole ‘nother level of salty, cheese, terrible-for-you cheese crackers. Well I’ve hit the next level, I’m ready to leave all of the other pretenders to the throne behind. 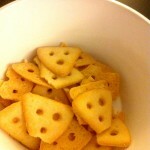 Cheeza crackers are the best cheese crackers I’ve ever eaten, and I can’t really imagine how anything will be better. The downside, of course, is that these can (and will) disappear some day. I’m always kind of assuming that I won’t see them on the racks on my next trip back to Japan. Ritz and Cheese Its will be around forever… Cheeza crackers, I don’t think Japan will know what it’s got until their gone. 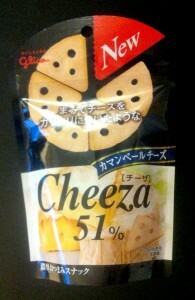 For more on how awesome these are, visit the Cheeza website at http://www.glico.co.jp/cheeza/. I don’t think I’ve ever ordered food online before, but I am sorely tempted to do so after reading this. I looooove good cheese crackers. 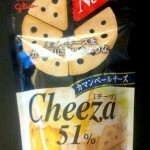 Pingback: » Review: Cheeza 52% Cheddar Oyatsu Break!